Kick drum and lead vocal present tough processing challenges in this month's remix. The drummer's recorded snare sound was not as crisp as it could have been, so Apple Logic's EQ and gating plug-ins were used to tighten it up.The song receiving the Mix Rescue treatment this month is 'Time', performed by the band Panic Number and recorded in a home environment. In many ways a conventional pop/rock type of mix, it is centred on drums, bass, and guitar, with a strong lead-vocal part and dense backing vocals during the chorus. The instrumentation and style are somewhat reminiscent of early Genesis, but with a little less prog-rock pomp. Where it becomes more complicated is that multiple layered guitar parts have been used, along with multiple layered backing vocals. Layering in this way is a well-proven textural device, but it makes mixing a little trickier, as it's very easy for the whole mix to get clogged up with texture, leaving no room for the song to breath. An interesting element of the backing-vocal section is a four-part choral effect (augmented by a straight four-part backing vocal), which I enhanced using a little subtle processing. 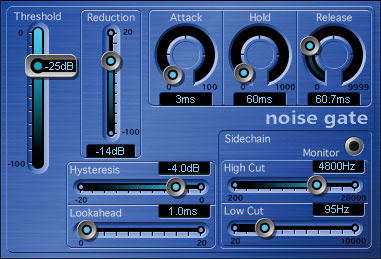 There is also a dense, pulsing synth part that worked well musically, but sounded a little static to my ears, so I used a simple flanger plug-in to create a kind of pulse-width modulation that gave the part more life and definition. 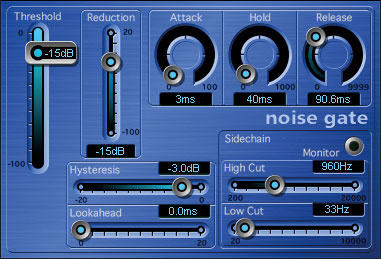 After scrutinising the original tracks, I also identified several 'sound source' problems such as some vocal pitching issues, dull vocal tonality (which also changed in the middle of the song), and a certain amount of low mid-range room tone on the vocal track that caused the vocals to sound somewhat congested. According to Andy Cope, who handled the recording, they hung a duvet behind the mic to help deaden the room acoustics, but they might have done better hanging it behind the singer, as this is where most of the problematic reflections come from. The drums were recorded cleanly over several tracks, but the kick drum had no depth of tone — a problem I've often found when tackling remix jobs — so once again I had to resort to processing trickery in order to give it the necessary weight. As usual, I tackled the entire project in Apple's Logic, as it's a sequencer I'm used to working with, but I utilised plug-ins from a number of different sources, and the vast majority of the techniques explored here could be replicated using any decent sequencer and plug-in package. I didn't use any pitch-fixing technology here, as the usual 'quick fix' plug-ins didn't seem to make a big subjective improvement to the lead-vocal sound. A few hours' work with something like Celemony Melodyne, could probably have sorted out the pitching quite seamlessly, but I think the band would be better off re-recording the lead vocal from scratch, as they should be able to get a much better sound. 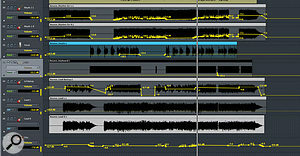 To make handling the mix easier, I subgrouped the drums, backing vocals, and guitar parts to their own stereo busses. 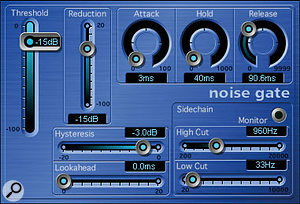 While there's little point in making over-critical sound adjustments to isolated tracks (because they always sound different when playing together), it can be valuable to try to fix some of the more obvious problems one track at a time, and then to fine-tune your settings in the context of the final mix. You can also set up sub-balances of things like the various backing-vocal parts, as these may be harder to hear when they're part of a busy mix. To my ears, the band's original mix was guitar heavy and a little cloudy sounding, but it certainly had plenty of energy, and the general quality of playing was good. The distorted guitar parts all had similar sounds, and three of these had been doubled up to produce a richer effect, so balancing all seven guitar lines turned out to be a bit of a juggling act. I usually start out a mix by setting up a solid foundation of drums and bass, but before I could do that here I needed to sort out that lightweight kick-drum sound. 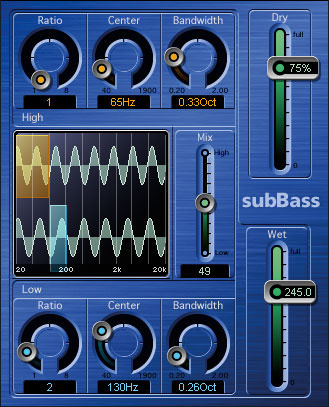 Having tried EQ and compression, I resorted to using Logic 's SubBass plug-in to generate some low end. This seems to be becoming a habit, but it's not something I've needed to do before embarking upon the Mix Rescue series. The trick is to add just enough sub-bass to fill out the sound without exposing the trickery, and in this case I ended up with what felt like a very solid and satisfying kick sound. 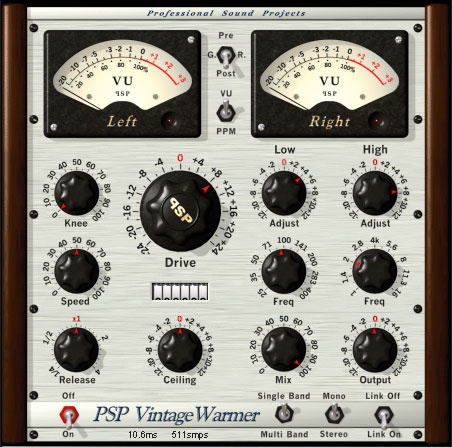 In addition to the sub-bass generator, I also gated the kick to reduce the amount of spill by around 12dB, and then used PSP Audioware's Vintage Warmer plug-in to add a bit of analogue-style saturation to give the sound more density. This wasn't overdone and worked well once the rest of the kit was added in. The rest of the kit was recorded cleanly with separate close mics and stereo overheads, though the toms seemed to be having trouble cutting through the busy mix, so I used Logic 's Exciter plug-in to give them a bit more edge, but nothing too drastic. Other than using some high-end 'air' EQ on the overheads, and rolling out some low end, there was only gentle polishing required. I used some gating and EQ to make the snare drum sound tighter and crisper, but again I didn't do anything too drastic to the original drum sounds other than the kick drum. 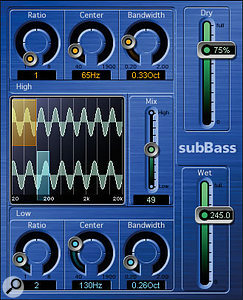 I did, however, apply further processing to the whole drum submix using the Noveltech Character plug-in from the TC Powercore arsenal. I opted to use that in combination with a lesser amount of overall EQ, as that seemed to give the most solid and lively kit sound, which cut through the mix without sounding too hard or edgy. If I knew exactly what this plug-in did, I'd tell you, but although I know what effect it produces and I can handle the controls, I've no idea what's going on inside the algorithm! I consider it to be a 'more of everything' effect. Something else I've also discovered about 'home recorded' acoustic drums, including those recorded in my own small studio, is that they have no real sense of space, so in addition to the usual ploy of adding a little reverb to the snare and perhaps the toms, I also like to put the whole drum track through a well-chosen small-room ambience treatment, in this case a convolution-based drum-room ambience courtesy of Logic Space Designer 's Garage preset. Adding just enough ambience to take the dry edge off the sound makes the drums sound more believable and lively without cluttering the sound. A pro-studio recording of this type of material would probably see the drums set up in a nice-sounding live room, so that's the effect I was going for. For 'conventional' reverb, I set up a short, bright plate using the Universal Audio UAD1's Plate 140 plug-in on send one, and also added this to the main- and backing-vocal parts. The band Panic Number are Andy Howard, Alex Moon, Chris Marsland, and Andy Cope. Based in Somerset, they are already playing live dates, and are currently putting together a first album. Influences include Elbow, Oasis, Muse, Soulwax, Björk, Radiohead, Placebo, Jeff Buckley, Vex Red, Doves, Supergrass, Starsailor, Incubus, the Beatles, the Smiths, Queen, and Coldplay. There was nothing wrong with the bass-guitar part, but I gave it a little more focus by putting it through Logic 's Bass Amp plug-in and then added some compression using Logic 's own compressor, just to keep the level even. That made it sound a bit on the forward side when soloed, but in the mix it sounded fine. Soloing the drums and bass at this point revealed a much more cohesive-sounding foundation for the track. 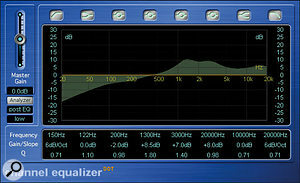 The lead-vocal part caused the most problems during the remix, and radical EQ was required to deal with the original's clouded sound. I like to get the mix to the point where it sounds more or less believable with all the faders left static, after which I can use automation to bring out or suppress certain elements. In this case the guitar parts needed the most attention, as they all employed a similar overdriven tone and were pretty 'full on' a lot of the time. I rather liked the 'wall of sound' effect this produced, but various parts needed to be dropped or lifted to keep the guitar out of the way of the vocals and also to reinforce key parts in the song where the guitar riff is important to the song dynamics. 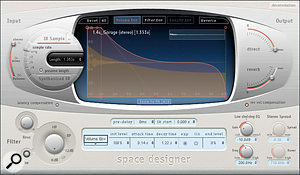 The song opens with a layered guitar part to which a phaser effect had previously been applied. I panned these tracks to create a wider image, but otherwise left them pretty much alone, using just a little high and low EQ cut to focus the sound. 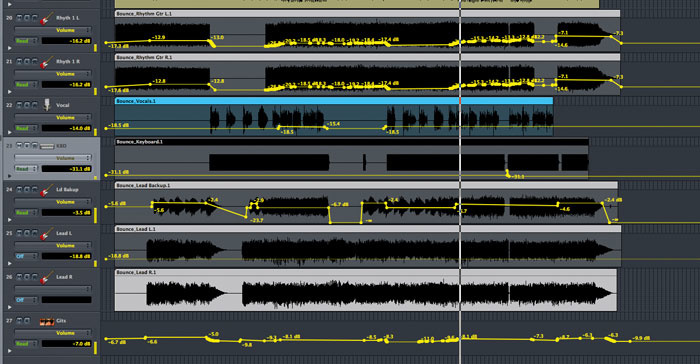 I ended up automating the vocal level too, as it tended to sound over-loud in the quieter sections of the song. The backing vocals comprised two parts, each of four layers, where one part was fairly choral in nature, with all four voices singing 'aah'. To enhance the choral effect, I used the UAD1's Dimension D plug-in to add a subtle chorus-like sheen, but otherwise used only a hint of reverb. The Dimension D processing created a very believable ensemble sound to the layered 'aah' parts, lending a nice vintage feel, which I thought suited the song well. 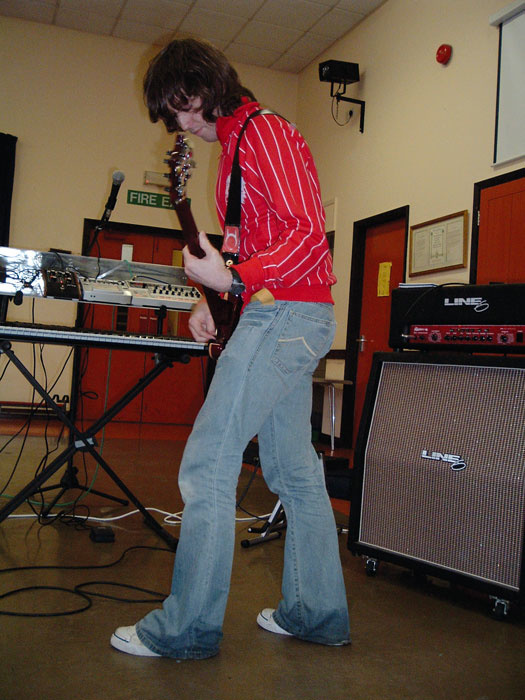 A large number of different guitar parts were recorded through the band's Line 6 Flextone II modelling amp. However, in order to create a 'wall of sound' effect, many of these parts were quite similar, and therefore needed careful balancing and automation during the mixdown. Although I was worried about handling all those guitars, it was the lead-vocal part that eventually gave me the most trouble, and I had to resort to extremely radical EQ to get it sounding closer to the way I felt it should have been in the first place. Even then I wasn't entirely happy with it, but without re-recording it I could have spent hours working on it and might never have managed to get it sounding better than I did. The vocal had a rather congested sound, as though the singer was recovering from a cold, and there was also a sense of small-room boxiness to the whole vocal track. More absorbent material in the recording room, behind the singer, would probably have helped. 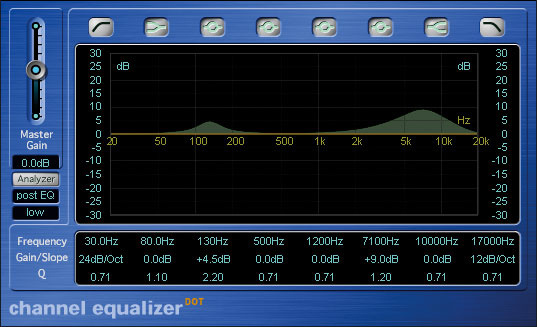 To help find a good vocal EQ strategy, I set up Logic 's Match EQ plug-in and used a solo recording of a singer with a similar-sounding voice to give me my target audio spectrum. 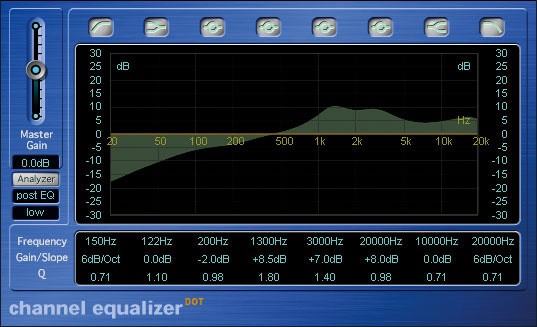 Applying this to the vocal in question showed that a lot of low end needed to be cut, and a significant mid-range boost needed to be applied to arrive at a similar spectrum. Rather than use Match EQ to do this, I replicated the general shape of the correction curve using Logic 's Channel EQ, and found this produced a very workable result with only a little further tweaking. However, as the vocals seemed to get even duller in the second half of the song (possibly because the vocal track had been compiled from several takes), I had to automate the EQ boost and level to compensate. Once I'd fixed the vocal EQ and added some compression, it sat nicely in the mix and felt much more confident than before. 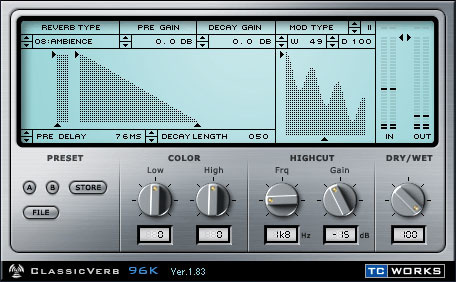 The UAD1 Plate 140 reverb seemed appropriate for the '70s style of the song, but I also snuck in a little TC Electronic Classicverb ambience to give the vocals a stronger sense of place, and to help thin down that small-room boxiness. Three different reverbs were used in the final mix. 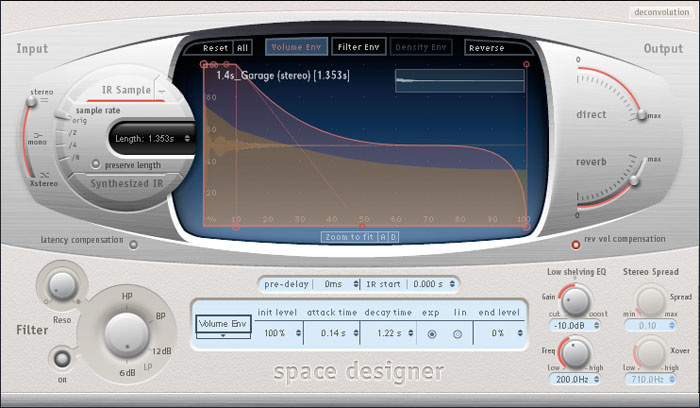 A Space Designer drum-room convolution patch was applied to the drums submix to give more of a live sound, while Universal Audio Plate 140 and TC Electronic Classicverb plug-ins provided more traditional plate and ambience treatments which were used more generally across the whole mix.Other than using some overall EQ on the backing-vocal submix to add 'air' in the 10kHz region and to roll off the low end below 200Hz, I used the Character plug-in once again to add definition to the guitar submix, but combined this with high-frequency cut to stop the overall guitar sound from being too edgy and to keep it out of the way of the cymbals. That done, I used Vintage Warmer once again on the overall mix to add some gentle compression and the faintest hint of a 'smile' EQ curve. 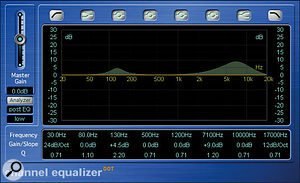 I also used its in-built limiter to keep a check on the signal peaks, allowing me to keep the average level fairly high. The big knob in the middle of the plug-in's interface adjusts the amount of 'analogue' drive, and has to be used very sparingly if the effect isn't to become too obvious, so I used just the barest hint. Overall I was pleased with the general feel of the mix, which had a nice, homogeneous '70s sound to it, rather than being ultra-separate and clinical. As usual, I kept the vocals, bass, and kick drum in the centre of the mix and then spread out the other parts to inject some sense of stereo width. With doubled-up guitar and backing-vocal parts this is easy to do by panning left and right, but I try not to pan too many things hard left and right, as it can sound very unnatural. Similarly, you'll notice from the mixer view that the drum kit isn't panned to sound particularly wide. Even so, the mix presented a nice stereo sound stage when heard over monitors. I found myself restricted to an extent, because some of the tracks provided had already been processed and/or bounced (the choral vocals had been processed with Antares Auto-Tune, and the guitar sounds included some effects), and because the original vocal part was particularly challenging. However, as an exercise in what can be achieved, I think the project was successful. As ever, jobs like this also highlight the limited extent to which imperfect audio can be repaired, and there comes a point where you have to say that if you were working on a commercial release, you'd have to re-record some of the parts — in this case the lead vocal. The vocal and guitar levels needed careful automation to create a satisfactory balance throughout the track. Those who've read my articles on mixing before will recall that I've said on many occasions that you should never try to fix up a piece of problematic audio by using effects. There's a standing joke that if something is being difficult, you simply flange it! So in a moment of rebellion that's exactly what I did to the vocals on version two of this mix, using the Waves Metaflanger set to produce a very slow sweep with a fairly long delay time. The result falls somewhere between flanging and double tracking, but I'll leave you to judge whether it is an improvement or not! 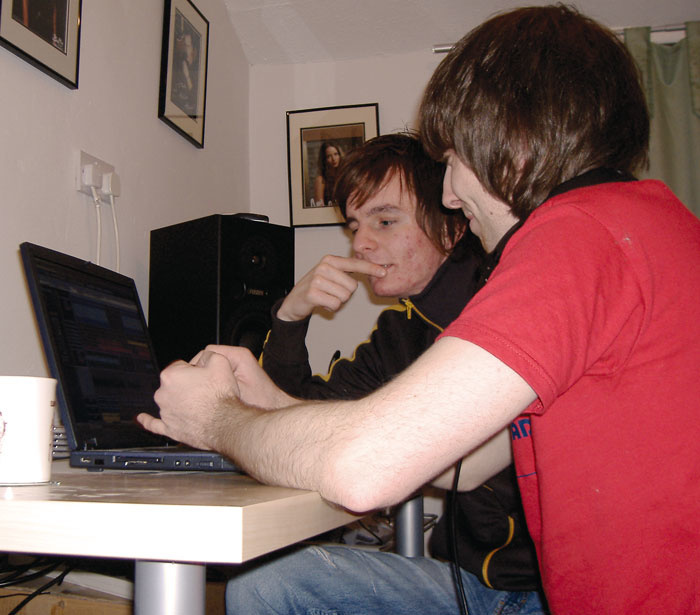 Andy Cope: "This was the first track we recorded and mixed entirely ourselves, so it was a bit of a learning curve. All the instruments on the track were recorded individually into Steinberg Cubase SX via the M-Audio Firewire 1814 audio interface. The drums were recorded first, in Andy Howard's front room using a CAD drum mic set and a Behringer ADA8000 preamp, and all the guitars were added using a Line 6 Flextone II modelling amp. All the vocals were recorded in my bedroom using a Rode NT1000 plumbed straight into the M-Audio's mic input. We had to cover the radiator with dressing gowns to stop it ringing, and we hung a duvet over a mic stand behind the microphone to deaden a few reflections and generally attempt to make the recording area smaller. We mixed using Fostex PM1 monitors, but the room we were in turned out to be bass heavy, so our mix ended up very bass light. "The new mixes sound great. We've agreed amongst ourselves that, had we been in the room with you, we probably would have been urging you to nudge the guitars up a bit, and we also preferred the version without the flanged vocals, but it's all down to personal preference in the end, I suppose!" This is the Original Mix as sent in by the band. Backing vocals with reverb and a Dimension D chorus effect. Kick-drum track processed using gating, sub-bass generation, and analogue emulation. 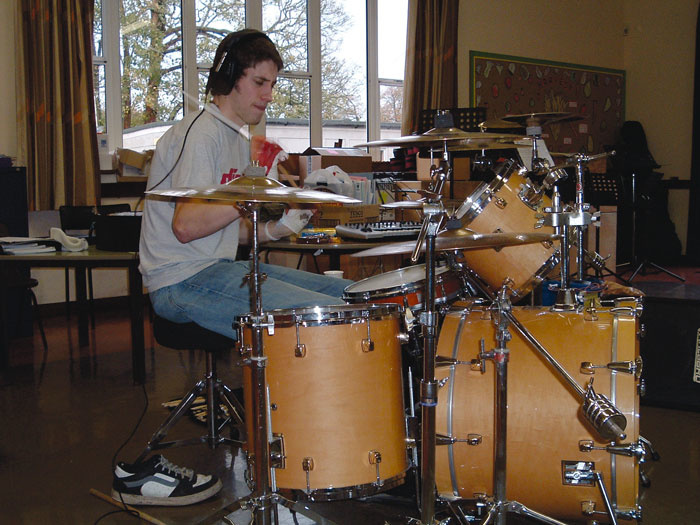 Drum mix using unprocessed original tracks. New drum mix with individual and global processing applied as described in the article. 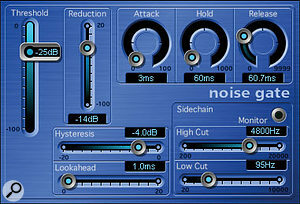 Synth processed using Logic 's flanger to create a pulse-width-modulation, chorus-like effect. Original vocal with no processing. Final vocal processed with EQ and compression, and with plate reverb and room ambience added. Remixed version of the track. Remixed version of the track with an additional flanging effect applied to the lead vocal.